A car's floor mats serve a very practical purpose. They slow the access of the dirt off human feet to the fibers of the carpet underneath. Dirt often includes particles of grit or even glass that can cut into carpet fibers, so protecting the underlying carpet is very important in extending its life. Automotive carpeting is also occasionally exposed to liquids from spills and tracked in rainwater, and this, too, can be damaging if a rubberized mat is not in place to protect the actual floor covering. 2104+ Corvettes should have functional floor mats in place, and these mats should be taken out and cleaned whenever the car is washed. The carpet should be vacuumed at the same time. C7 Stingray Corvette Lloyd mats are very good at preserving the carpet, but they also serve an additional purpose: they enhance the appearance of the car. 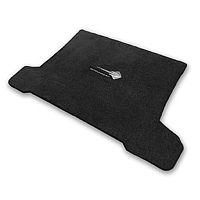 These mats and the cargo mats that protect the carpeting in the trunk are contoured to the space. They come in a variety of materials. Usually dark in color, Lloyd's mats often carry the Corvette name or emblem or both. This prestigious logo on the floor of a car helps to turn the overall visual effect into a unified whole and helps make the car exhibition-ready. Floor mats are available at discount stores and flea markets, of course, and some of them may even carry the Corvette logo. Whether or not they fit in the area for which they are intended and how good a job they do at protecting the carpet is debatable, and they are certainly unlikely to be Lloyd's floor mats. 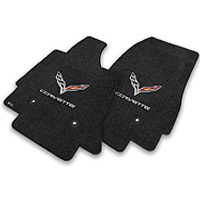 Premium mats from Lloyd's are readily available from outlets like Corvette Mods, which prides itself on providing only the highest quality parts and accessories for your late model Corvette.